ang Lu Chan, his family and his students had a tremendous impact over the past two hundred years. They introduce the world to the mysterious and wonders of an unique martial art that is both well suited for self-defense as well as providing health benefits. The following traces the Yang style family tree highlighting direct family members of Yang Lu Chan and the major proponents of this style. The Ottawa Martial Arts Association has completed Phase One of our result in the history of the Yang Style. A collection of over four hundred and eighty names are listed. Please let us know if you additional information on the history of the Yang Style. 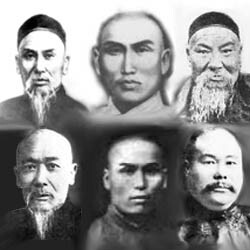 The Ottawa Martial Arts Association is currently creating a list of Yang style practitioners around the world. Please e-mail us if you have wish to obtain a copy of the list or if you have questions and comments concerning our research.